Hmm. 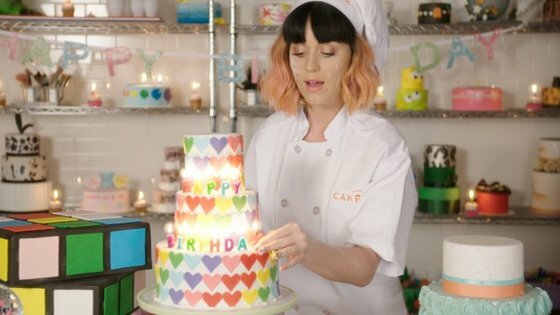 Katy Perry's quite good pop record Prism is about to yield another single and this one will be "Birthday". While I'd still prefer her to release either "Legendary Lovers" or especially "International Smile" (or what the hell, while she's at it, "Walking On Air"), I do get the choice - the track has some undeniable catchiness to it. It'll be much better than the trap-riddled "Dark Horse" anyway, I never really understood the buzz it succeeded in creating. Now Perry's released a teaser of sorts of the upcoming music video and it's hilarious. It features an assortment of "World's Worst Birthday Party Entertainers", all played by Perry herself. These characters include a past-her-expiration-date showgirl Goldie the Dancer (Goldie after her "golden nuggets"), an awkward Jewish showman Yosef Shulem the MC ("Did you hear about the rabbi who did free circumcisions? He only did it for TIPS!") and a social media-obsessed, nasal-voiced young lady called Princess Mandee (or as she's known on Twitter, @mandeerogersakalil_prncessmandee) who dresses up as a princess and paints children's faces, wishing them "Happy Birthday bitcheees". On a side note, she plays the different comedic parts pretty well! The lyric video's out already so you might as well check that one out, too. Lots of frosting and confectionery skills have been used in order to present the lyrics in a literally sugar-coated manner. Okay, I'm sure "Birthday" is going to be a fine single. And perhaps she's set "International Smile" aside for a later release 'cause it'd make a terrific summer hit for sure! Yes, that must be it. EDIT: Coincidentally, this was also the release date of the actual music video so I added it here. It's hysterical: it features pranks where Perry participates in five different parties, each with a different disguise. Then she does all this crazy stuff there to dumbfound the partygoers, such as putting a mouse in her mouth, dancing around with an old man's leg prosthesis and causing a car crash. I was just literally laughing throughout the video, it was so freaking funny - especially the parts with Goldie. Watch it below! kids party entertainers will thrill the littlies with their range of ideas. Who knows – one day your child could be a pop superstar, maybe even win The X Factor, thanks to the inspiration they got at a disco party for kids.